This charming aparthotel is located in one of Murcia's most important tourist districts, and has direct access to the Mar Menor and Mediterranean Sea. The accommodation is 500 metres from the centre of San Pedro del Pinatar, and here guests will find a variety of restaurants, bars and shops. San Javier-Murcia Airport is 8 km away and Alicante Airport is 62 km from the hotel. 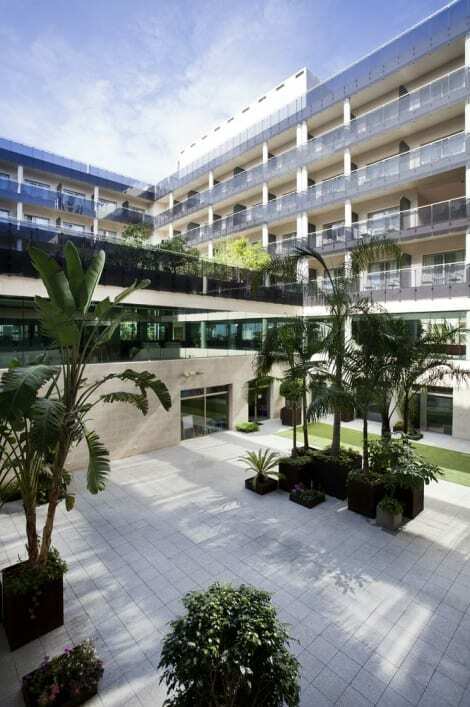 This air-conditioned property has a modern style and comprises 35 apartments. There is also a range of facilities available to its guests. All apartments have a fully fitted kitchen with fridge, microwave oven, iron and ironing board and utensils, ensuring guests feel at home. Guests can soak up the sun on the sunbathing terrace while fans of the fairway can tee off at the golf course just 18 km away. Hotel Neptuno is a central, comfortable and well located hotel just in front of the Mar Menor. In fact, we are the only hotel in front of the sea in San Pedro del Pinatar. We offer a cosy atmosphere in a luxury emplacement, being able to give you unique views to the beaches, mountains, isles, flora and fauna of this privileged part of the province of Murcia. Next to our hotel you will be able to practice diving, sailing and canoeing in the Mar Menor and the Mediterranean Sea, as well as seeing the curious Manga de Cartagena and the Parque Regional de las Salinas. Featured amenities include complimentary newspapers in the lobby, a 24-hour front desk, and multilingual staff. Planning an event in San Pedro del Pinatar? This hotel has facilities measuring 1076 square feet (100 square meters), including a meeting room. Guests may use a roundtrip airport shuttle for a surcharge, and self parking (subject to charges) is available onsite. Enjoy a satisfying meal at Restaurant serving guests of Hotel Alaska. Buffet breakfasts are available daily from 8:30 AM to 10:30 AM for a fee. Make yourself at home in one of the 78 air-conditioned rooms featuring minibars. Rooms have private balconies. Complimentary wireless Internet access keeps you connected, and satellite programming is available for your entertainment. Bathrooms have bidets and hair dryers. It has a thalassotherapy with water from the salines of Minor Sea, with therapeutic prorieties which can only be compared with the water of the Dead Sea. Its high saltiness and richness in minerals, united to a nice and gentil treat, this make the hotel a place you will have to come back. Its medical services will warrantee an absolute trust on different programs. Also, it has all kind of rituals for the well-being of your mind and body, with anti-stress therapies but also slimming and obviously, a big variety of beauty and esthetic treatments. lastminute.com has a fantastic range of hotels in San Pedro del Pinatar, with everything from cheap hotels to luxurious five star accommodation available. We like to live up to our last minute name so remember you can book any one of our excellent San Pedro del Pinatar hotels up until midnight and stay the same night.